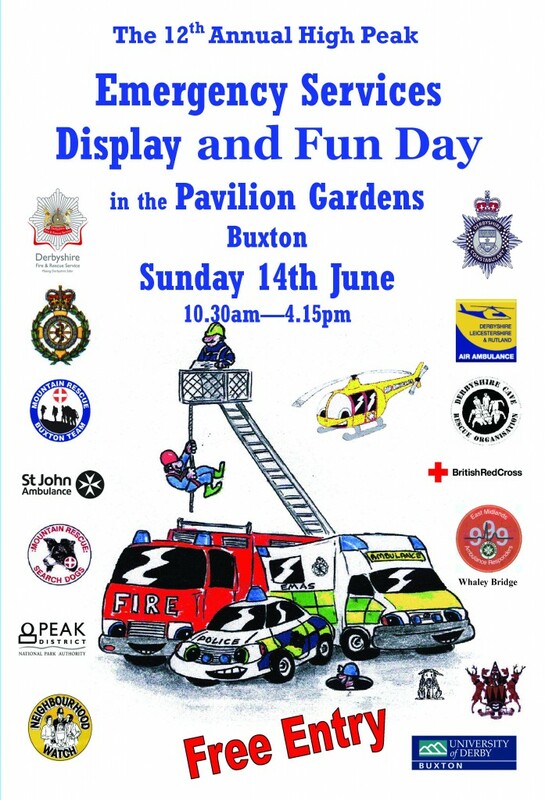 The 12th Annual Emergency Services Day will be held on Sunday 14th June at Pavilion Gardens, Buxton between 10.30 am & 4.15pm. It doesn’t matter how old or young you are this day has something for everyone – and its FREE! Supported by all the blue light emergency services, the day is full of action and excitement with spontaneous fires breaking out, head on traffic collisions, rescues from high buildings, rescues from deep underground caverns and of course, dramatic rescues from cliff faces! There is also an opportunity to be licked into submission by a search and rescue dog (please don’t feed the handler), and to learn emergency first aid with St John or the Red Cross. Apart from the central arena demonstrations there is plenty to see and do. The day is a great opportunity to get to touch and understand the equipment used by all the emergency services. There is plenty of fun too with Bill’s Billerettes making an appearance and an inter-services challenge event. So come down to Pavillion Gardens, Buxton, and meet the rescue team who will be falling off a scaffold tower at regular intervals throughout the day. Get lost in the Cave Rescue ‘Cavern of Doom’ or watch how your chip supper can replace your central heating in just a few dramatic minutes. Lots of information, loads of fun – all FREE !! !